We are at the end of the month. How are your new year's resolutions holding up? I personally did not have any specific resolutions for the new year, but I did want to go back to working out consistently. I have noticed a lot of memes on instagram and twitter making fun of people who have already given up on their goals for the new year. I think these memes are really sad because I feel that they only do more harm by further discouraging those who have been struggling to commit to their goals in the first place. I also believe that social media makes it easy to compare ourselves to those that are doing better and this makes us forget that we need to solely focus on being better than yesterday. Who is to say those "successful" people you are comparing yourself to haven't had any setbacks? You can get to where you want to be as long as you keep going. Who cares if it's been 2 days, a week, or even years! You guys have no idea how many breaks I have taken from blogging. Every slump was definitely discouraging, but I always came back with so much excitement and determination. What are your tips for staying on track with your goals? Speaking of set backs, I took these pictures 2 weeks ago when I went to San Diego and I am barely posting! It is also strange looking back at these pictures where I am wearing a sweater, scarf and boots when the weather is currently much warmer. I will admit that I threw this scarf over my shoulders this way because I don't know how to style oversized/blanket scarves. I really loved this simple and cozy outfit, except that my sweater folded in at the bottom and I did not realize it until now. My husband photographer takes his job very seriously and is usually too focused on getting a quality photo to point out flaws like messy hair, untucked blouses, etc... His commitment is on point. I hope you've all had a lovely month of January! Thank you for stopping by! Love the look on you doll. Looking great as always!! Just follow you on IG. Thanks for stopping by my blog.Have a wonderful week ahead! You look gorgeous Perla! I set goals, but I don't make resolutions. I find making resolutions pressuring. I agree I think those types of memes do more harm than good! Have a wonderful February! I agree with you! Sometimes resolutions are not realistic enough and I think that's why people end up giving up. Wow!! those boots are so lovely! Las fotos son estupendas! Me encantan las botas! ♥️♥️♥️Feliz día ! Thank you hun! As long as you don't give up, you're good to go! I agree that we can easily fall into a comparison trap when we spend a lot of time online. It's important to remember that what we see online is not always real. I really appreciate such a lovely comment! THank you! You can go through anything, carina. And you look beautiful! LOLZ....you and the hubby are too funny:D I didn't even notice the folded sweater, girl! And yeah...I also don't know how to wear oversized scarves which is why I don't have one:P I think you look fab though and totally styled it so nicely. I shouldn't have mentioned it then lol. Thank you so much hun! I do not do resolutions I focus on goals I will want to do each day. You look fab great combo. As per meme it only harm those who acknowledge them. That is a great strategy to have! Thank you so much! Wine red is such a fabulous colour of mine! You look fantastic and I love how you paired it with grey hues. What a gorgeous cozy chic look! I adore the scarf and boots especially. I am really happy that you are back! Yes I agree and I admit that is something that I am currently struggling with. I have been posting for the sake of posting and I would like to start putting more thought into my content. Can I first say that I adore the color of the jumper and the boots? It is still very cold here in Germany, so I need all the layers. My resolutions are coming along well, although they weren´t exactly New Years ones, but ones that I made in the weeks before the calendar changed. Like you said: Just keep going! Awww thank you so much! That's good to hear hun! I love your fashion sense and style. Specially your boots! so pretty! you are very great and everything looks good on you. Awww that is the sweetest thing! Thank you! I'm jealous of your warm weather, it's still freezing here. The outfit is really nice. As for resolutions, I don't put anything unrealistic in my goals. Awww I hope you are keeping warm and that's always a good idea! Gorgeous look! I like so much your burgundy boots. Have a lovely sunday! love your over the knee boots. You look sensational!!! Great styling. I do agree that social media makes it easier for us compare ourselves with others in unhealthy ways. Social media can indeed be very discouraging if people let it be. We should just all do our thing and not worry about what other people think as long as it's right for us. I'm so jealous that it's already warmer in your part of the country. 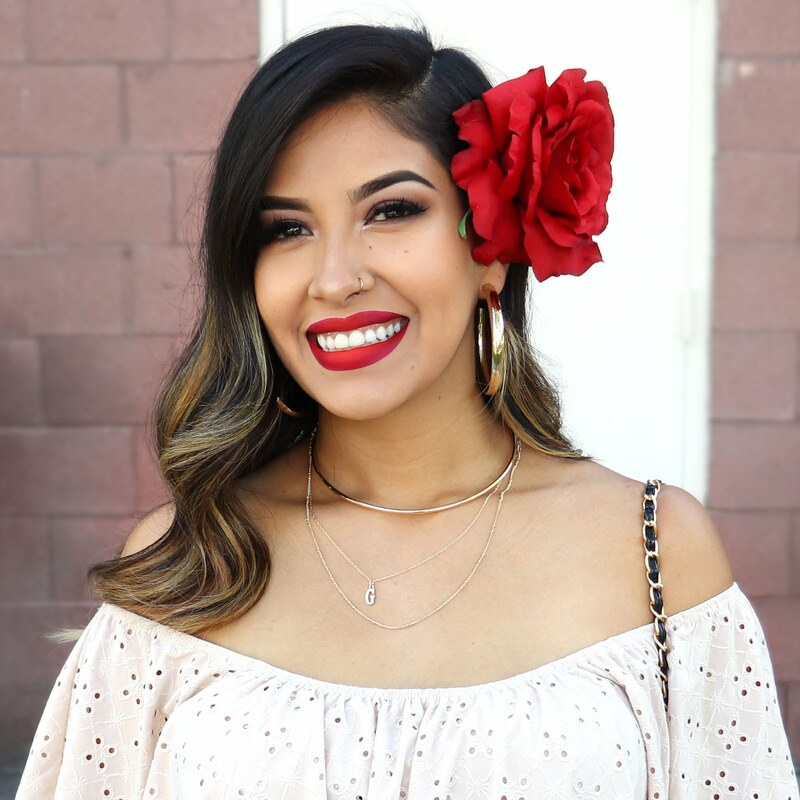 This look is so chic and cozy and that shade of red is gorgeous on you Perlita! You look so gorgeous and I love the burgundy in your outfit! You are 100% right about focusing on being better than you were yesterday. It can be so easy to get caught up in the comparison game on social media, but everyone has their own challenges. I hope you have a wonderful February and good luck with your resolutions! You got this girl! You are so sweet! Thank you very much! Such a beautiful boots! You look so gorgeous! Aww you look incredible babe! It is a shame that people compare themselves too much. I honestly just stop paying attention to others on social media. I barely watch Insta Stories and only follow accounts that inspire and motivate me to be my very best. You are so sweet! It's good to do a social media cleanse. Really, these demotivating memes are not cool to see. Everyone has their time and the process is also important. I strongly agree that the main thing is to try "being better than yesterday". I liked your pictures in San Diego, you look beautiful. And I also don't know how to wear scarves haha, but I think you got it right because the look was great! Awww you are always so sweet! Thank you! I love this look! You look so pretty in burgundy! Beautiful outfit! Love the colours. Keeping the hard work is what matters but not comparison. Every successful person had a setback, well said girl! A thousand times we fall, a thousand times we rise. so true! I have been seeing those memes too and if I did have grand goals I couldn't accomplish they would definitely bum me out! But I've learned from so many failed resolutions that I just don't make them anymore lol! Lmao! That's always a good idea too! This is such an amazing outfit hun, you look great! I love this burgundy shade on you- and I totally know where your husband is coming from; my best friend takes my photos and she's normally so focused adjusting the settings that she can miss things like a tag sticking out, haha. Ooh! I love the deep red shades of this outfit babe; you look so gorgeous! Ahhh i'm happy to hear the weather is warming up for you over there already, it's SO cold here in the UK haha. You have a pretty good photographer dear! ha! Anyway, such a cute ensemble you have here. Love the sweater. This outfit is gorgeous, you look stunning! I love how you've matched the colours together, and the boots are awesome! Also, I find myself trying to sort out too many goals and then I stress out about not meeting them all, so just trying to be better than yesterday is something I should keep to. Your outfit too much beautiful. Like your blog. Thanks for share with us. You look so gorgeous. Thanks for posting.